12" X 10" X 2 1/2"
when we travel the inclination to see all is to look around, to look up, to cast one's eye around the environment. but..it is important to remember to also look down (on the ground) because you never know what treasures are there. the cloth in this assemblage is cloth i found, on the ground, in the sand, dust, dirty streets, during my travels in west africa. i scavanged the cloth, took it to my hotel , washed it..and brought it home. i decided to use the cloth as a "quilt" (so to speak). since i do not sew...i glued it on the wood. 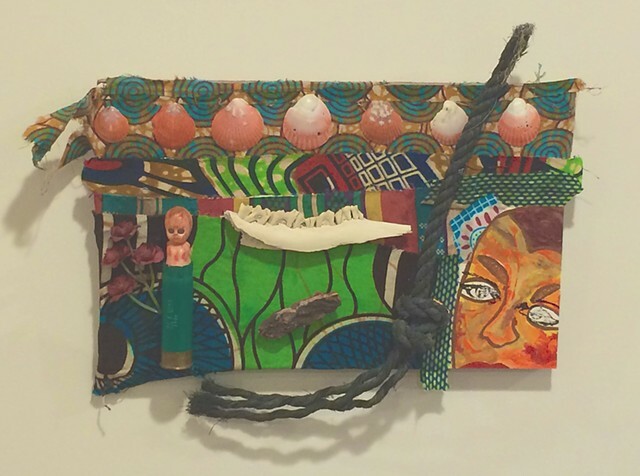 the other objects in the assemblage represent aspects of africa. the bullet shell casing and the "bloody doll" are symbolic of the too many numerous wars in africa and all the children that are killed. the flowers represent the peace i wish was there. the jaw bone is symbolic of the beginnings of all life...in africa...as is also the petrified wood and the shells (life originated in the oceans). the rope represents the ties that should bind all people of the planet.......we are all one person in origin. we should be tied together.....united. of course each viewer can have their own interpretation of an art piece. this is mine. Magnificent collage! Truly captures the spirit of Africa! Oh, great !!! I like this image - assamblage very much ! Great work and meaning, Jennifer :) Have a lovley week! Lovely to see what inspires you, great work! Interesting composition. There are a lot of meanings inside... There's all the africa in this... congrats! Quite an interesting land/lifescape, Jennifer! t's one thing to find things, quite another to put them together so effectively. A very well done assemblage. Your interpretation is just so generously depicted and inspiring Jennifer. You have a way of seeing the world that is beyond the realm of most unaware people that go about their daily lives. Wonderful. I agree with your sentiments 100%. One world and one people and one Human Race. Amazing work Jenifer ! Have a wonderful weekend ! Great collage and abstract effect. AN inspired piece of work here, Jennifer. I love it! Have a great weekend. Amazing work Jennifer, at first I thought it was a bag or purse but what a fantastic way to remember your journey. Una belleza y super original!!! Love this piece of work especially its symbolism. WOW, this is excellent! Great job my friend! Very interesting explanations and painting ! A complete artwork african combo realized with such a priceless creativity ! Have a great week ahead. Jennifer and keep on creating these lovely pieces of art. Mi malkonas por opinii sufi an belas. Excellent colours ... beautifully formated too ... a well executed creative piece of work ... exceptional composition and presentation too! !